Magdi S. Mahmoud received B.Sc. (Honors) degree in communications engineering, M.Sc. degree in electronic engineering and Ph.D. degree in systems engineering, all from Cairo University, Egypt, in 1968, 1972 and 1974, respectively. Currently, he is a Distinguished Professor in the Systems Engineering Department; KFUPM, Saudi Arabia. 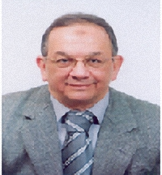 Dr. Mahmoud is internationally recognized as an eminent researcher in the systems and control field. His activities and books in interconnected systems, networked-control systems, and renewable-energy systems have become guidelines to many researchers in North America, South-East Asia and Europe in advancing systems engineering research. He is the principal author of thirty-six (36) books, inclusive book-chapters and the author/co-author of more than 525 peer-reviewed papers. His research interests include the operation and control of cyperphysical systems, distributed control and filtering, smart grid and renewable energy systems. Dr. Mahmoud’s innovative research has been leading academia and research development worldwide, and will lead to new advancement in systems engineering. He is the recipient of two national, one regional and several university prizes for outstanding research in engineering and applied mathematics. He is a fellow of the IEE, a senior member of the IEEE, the CEI (UK), and a registered consultant engineer of information engineering and systems Egypt.